The weather is hot as the Seeds of Gold team arrives at the Wambugu Agricultural Training Centre in Nyeri for a farmers’ field day. We find tens of farmers and exhibitors already at the event showing the eagerness with which they want to share knowledge. Gichangi Mahinda is among those in attendance and he is hawking ‘popcorns’ made from several cereals. A curious crowd of farmers gathers around him to get a taste of his never-seen-before ‘popcorns’. 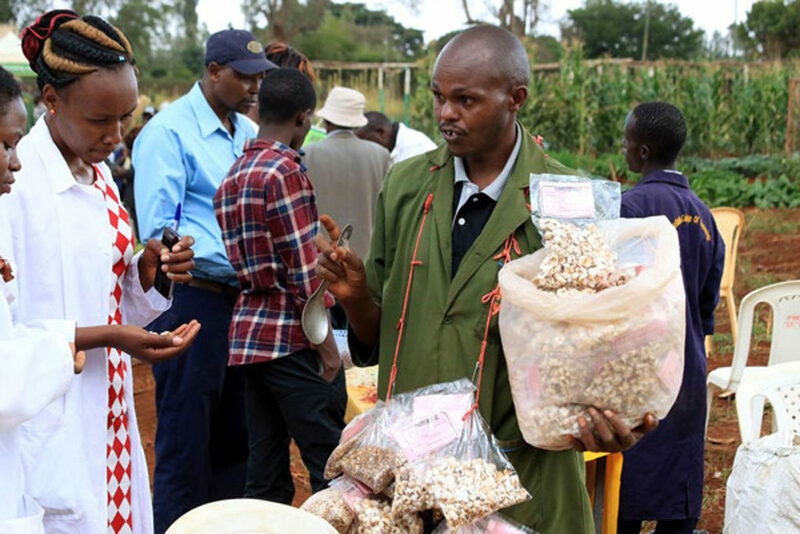 He makes the ‘popcorns’ from rice, wheat, ordinary maize, pearl millet, millet and sorghum under his business Gichangi Cereals and Spicers based in Embu. “How do you pop these cereals?” a farmer asks in surprise. Machine that goes for Sh300,000, which pops every cereal, from sorghum to wheat. “Each grain needs different pressure to pop in the machine. Depending on the grain, some stay longer in the machine, which resembles a pot and has a pressure bar. Normally, I pop a kilo of each cereal,” he says. So, what would make wheat, sorghum, pearl millet or millet to pop? “The grains have a husk, thus, under medium heat they would pop but not necessarily like corn,” he says. “Every grain pops at varied pressure on my machine. Rice pops at 10, millet at 12, maize at nine, sorghum at 12 and wheat at 10,” Mahinda adds. According to him, before the grains are popped, they must be dried thoroughly to end up with a moisture content of 13 or below. Before popping, he says one must check for moisture content of the crop to avoid aflatoxin contamination. “I wash the cereals, then dry under the sun for two or three days before popping,” says Mahinda, who has been a cereal trader for over seven years. Mahinda does not pop the grains with oil but instead uses honey for a unique taste. He started the business after attending a training by Bioversity International, which works to improve nutrition and climate change adaptation, in 2013. In a day, Mahinda who has two workers, says he pops a total of 10kg of cereals, that is, 2kg from five of the grains. A 90kg bag of maize in the market is selling at Sh4,000 up from Sh3,000. This translates to about Sh50 per kilo. After adding value, Mahinda sells from 25g package at Sh20. He is in the process of getting the Kenya Bureau of Standards (Kebs) certification. The organisation is currently carrying out tests on the products before it gives him a certificate that would allow him sell in formal retail outlets. Simuyu Augustine, a nutritionist at Outspan Hospital in Nyeri, says the products are healthy and help in increasing consumption, especially of grains like millet and sorghum but using honey to pop them may make them too sugary.